Beautiful Rustic Cabin on the Rogue River!! The Rogue Riverlodge is an excellent choice for that Family reunion, weekend retreat, romantic getaway, short or extended vacation. It was built in 1920 and evokes a time gone by when friends and family enjoyed conversations and the great outdoors. From the deck of this restored old fishing lodge you can relax and reconnect at your pace while you enjoy all the amenities. The Riverlodge grounds are big, situated along 45 BLM acres of fishing banks inaccessible to others and bordered by pristine forest acreage. Riverlodge offers the conveniences of modern living and the charm of a Zane Grey novel. The main house comfortably sleeps 7, in 3 bedrooms with 2.5 bathrooms. It was built in 1920 We can expand with an additional 2 bedrooms, shower, adjacent 'bunk house' and twins in a classic Airstream "Limited" to accommodate extra large groups that like to stay with us. The house has an enclosed porch, living and dinning room space. Its set up with dining service for 12, all linens, Direct TV, player piano, horseshoes, frisbee, tetherball and other outdoor games. The spa is off the back deck facing the river. Since 1920 we have been a part of the National Scenic Wilderness Waterway where there is no longer any building allowed. All of our guests leave knowing that they have had a chance to experience an extraordinary home and plan to visit again. The fourth bathroom in the bunk house has a shower and toilet. Loved this property. It was beautiful, rustic and private. The cabin was perfect and just as described. The only problem was that the hot tub didn't work - that was disappointing. But we loved the seating area outside, the great dining table that flexibly sat all of us, the flexibility of places to put our family. The weather was perfect too and we got a wonderful recommendation for white water rafting that was much less expensive than the advertised places, and was perfect for us. Wonderful cabin and bunkhouse ...... amazing location on the Rogue River! We stayed at the cabin and bunkhouse during mid July - it was amazing! The cabinnhas everything you need and more ..... kitchen setup to meet w nearly every need, grill ready to go, outdoor firepit w tons of outdoor seating, rear deck that views the Rogue ...... washer and dryer if you need to do laundry..... deer who frequent the pond area at the entrance to the property, and a local welcoming committee which consisted of two very loveable and friendly cats and a dog. It was the perfect place to stay and enjoy Southern Oregon! We did day trips to the Redwoods and Crater Lake as well as to fish other sections of the Rogue. The daily contingent of river boat tours came through and were fun to watch as well as some drift fishing boats. Would love to stay again if we can get back to the area. I would highly recommend it to anyone!! The stove/oven was dirty and difficult to get lit. Aside from that the place was great; it was over 100 degrees one day and we didn't need air! River was lovely, neighbors very pleasant. A very quiet spot. We would all sit in the chairs outside the house - very nice. We enjoyed our stay at Riverlodge. The accommodation is rustic, but spacious and well equipped. The kitchen features 4 sinks along with every other necessary appliance. Lots of chairs, cushions, etc. The river can be seen from the deck and is a short walk through a blackberry patch, but no beach. The great room is delightful, with an attractive stone fireplace and comfortable sofas. The piano is not badly out of tune. Neighbors are out of view. Drive to town (Merlin) is 5 minutes; another 10 minutes to Grants Pass, where you will want to shop for most supplies. Riverlodge is very well priced and centrally located for area activities (wine touring, jet boating, etc.). 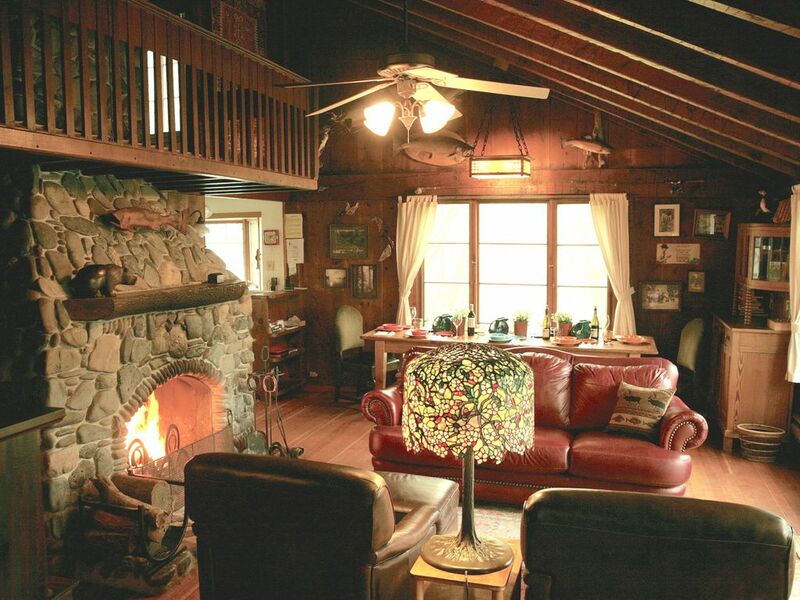 Such a beautiful property, the home is very much a rustic cabin in the woods. A real Oregon experience. We would love to go back. 1.8% Oregon lodging tax 3+ nights $240 up to 7 people. An additional $95 night, $25 cleaning fee for extra two bedrooms separate from the main house. Airstream trailer additional $95 night $25 cleaning fee. Two people only Discounts For Longer Stays.